I suppose there is no specific reason that the dish was named after the Isle of Capri, but there is a definite reason that it would logically originate in the Compania region. The two most important products of the area are buffalo mozzarella cheese and plum tomatoes. In both cases, you can’t find better examples of these ingredients anywhere in the world. Nobody knows from where came the water buffalo in southern Italy. Some say from Mesopotamia at the dawn of civilization. They only thing we know is that they have been there for over a thousand years, they constitute the dairy herds of region and they make Italy the world’s largest producer of buffalo mozzarella. This cheese is vastly superior to cow’s milk mozzarella and there is a reason. Buffalo milk has 7.5% milk-fat, while whole cow’s milk has only 3.25%. It takes 5 gallons of buffalo milk to make a pound of cheese while it takes 8 gallons of cow’s milk. Buffalo mozzarella is an incredibly creamy fresh cheese that, once tried, makes you wonder why they don’t require this ingredient in a Caprese salad. Buffalo mozzarella can be hard to find and is often very expensive. However, Trader Joe’s now carries 7 oz. balls of this glorious stuff for about $5.00. This is a perfect amount for two salads. Good quality extra virgin olive oil. 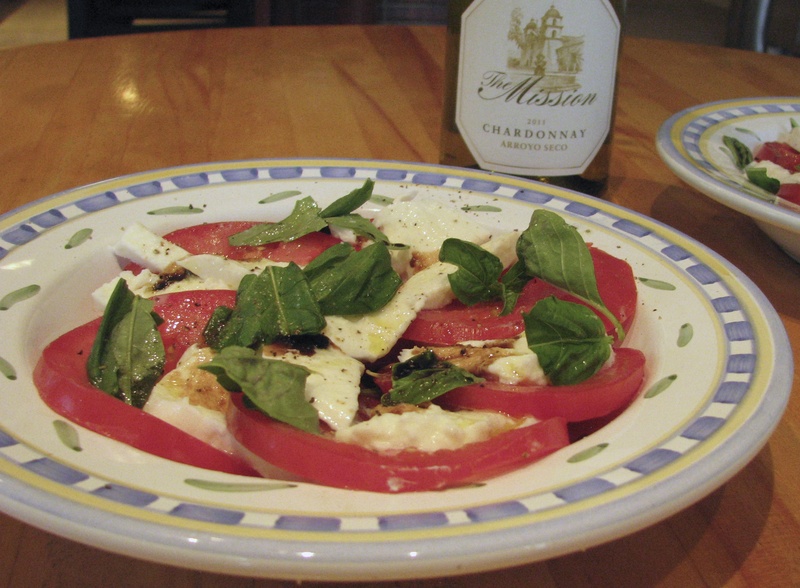 Arrange alternate slices of tomato and mozzarella on the serving plate or on individual salad plates. Tear the basil leaves into about four or five pieces and sprinkle on top of the salad. 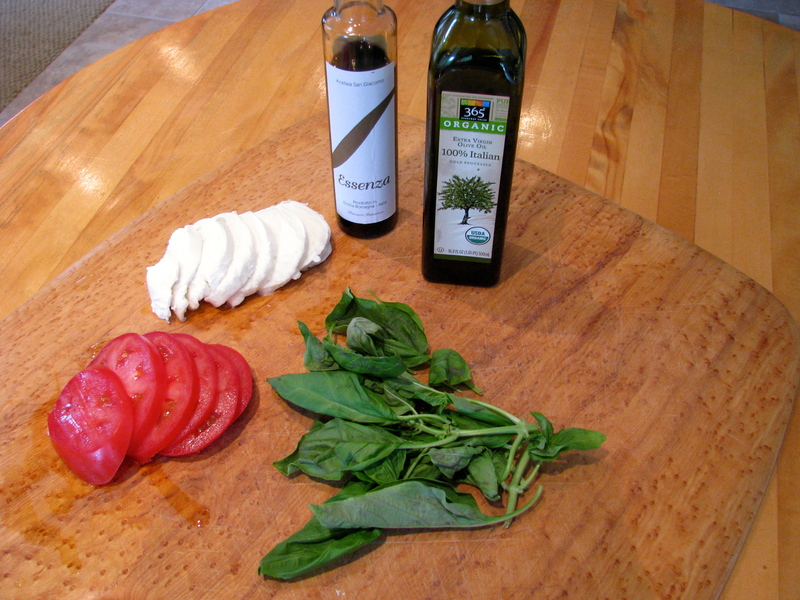 When ready to serve AND NOT BEFORE, add a few dashes of balsamic vinegar and about two tablespoons of olive oil. Summertime is a great time to make this dish. Make sure you get the right ingredients, add a bottle of chardonnay or sauvignon blanc to the agenda, and make lunch for that special person in your life. You will set the stage for a wonderful afternoon. I have not seen buffalo mozzarella in Costco. Would that they would have it. However, the Trader Joe’s product is very good and not that expensive.